The 34th All India Public Relations Conference commenced at hotel Peterhof today. 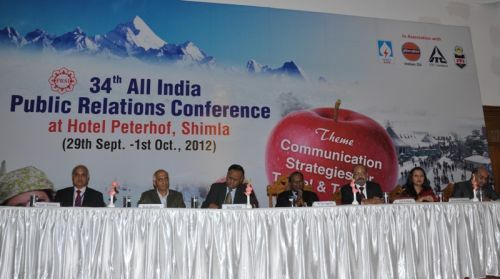 The theme of the conference was ‘Communication Strategies for Travel and Tourism’. Arye Juggesseur, High Commissioner of Mauritius, was the chief Guest in inaugural function and Ajay Mittal, Additional Chief Secretary (ACS), presided over the function. Speaking on the occasion Arye said that holding such conferences go a long way in Strengthening the bond between the two nations as Mauritius and India share a unique Relation. He said that the sustained efforts of PRSI (Public Relations Society of India) were commendable and the campaigns and conferences it was organizing throughout the country from almost last 50 years surfaces collective voice of PR on a common platform. Arye said that in present context the fast growing information, communication and entertainment technologies have brought about an upsurge of information intensive services which had radically changed the world. Even the Media was taking the tourism industry seriously recognizing the fact that travel and Tourism had a powerful impact on local and National economies. He said that PRSI had been actively involved in Media Transparency and highlighting the ethical values and building bridges between the organization and the clientage. Speaking to the theme of the conference he said that organizations and companies worldwide were dwelling upon travel and tourism for image building purpose. He said that Travel and tourism is one of the world’s largest economic sectors. Referring to the tourism in Mauritius, he said that Mauritius was an International recognized tourism destination and a glaring example of high quality tourism attracting high end tourists and at present accounts for 8.4 percent of the Gross Domestic Product (GDP). He said that political stability, safe and secure environment, strong social fabric with a warm hospitable people had enabled sustainable growth of tourism sector in Mauritius. He said that the Government of Mauritius had targeted India as one of the major growth markets for coming years and was dedicating a significant budget for tourism promotion. He said that tourism had emerged as the largest service industry in India and our country was embarking upon to enhance collaboration with India in field of tourism. Ajay Mittal, ACS said that Public Relations being a two way traffic mode and an effective tool of communication helps in formulating better policies and programmes through valuable feedback. He said that in the fast changing process of technology the responsibility of PR has far more increased. 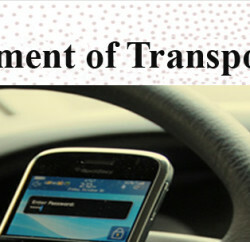 It is not only the job of the organization to cater to its clients but it has to perform in a much professional manner. He said that in the interest of the theme of the conference it becomes important to provide to the stakeholders the proper environment at the micro level. He stressed for proper communication network, better connectivity, supporting resources, the change in perception of the people towards the visitors and the guests, improved law and order and above all the culture and hospitality for taking tourism leaps and bounds and bringing about an economic revolution. 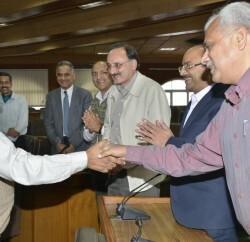 He said that the people in Himachal are simple and known for their warm hospitality as a result of which Himachal Pradesh today stands high above being the best tourist destination from rest of the country which was evident from the fact that it had received over a dozen awards from well recognized International and National agencies in the field of tourism promotion. He said that lots of efforts and initiatives had been taken in Himachal Pradesh for promoting tourism and many innovative schemes such as ‘ Har Gaon ki Kahani’, ‘Har Ghar Kuch Kehta Hai’ had been launched which gives a peep into the culture and traditions of the State. Mittal lauded had all praise for the initiatives taken by the Shimla PRSI Chapter under the able guidance of its President, B.D. Sharma for organizing this conference in a highly professional manner. He stressed for organizing such more conferences of International standard in near future. He hoped that more valuable suggestion would pour-in through deliberations in the conference which would go a long way in promoting tourism activities in a big way in the State. Dr. Ajit Pathak, National President PRSI lauded the efforts of the youngest PRSI, Shimla Chapter for hosting this conference. Together with playing the role of building bridges between the organizations and the communities, he stressed for adopting ethical values in the profession. He said that the Global Ethical Protocol had been adopted by PRSI to eradicate unethical practices from the profession. He said that the job of PR was building images and the PR professional should abstain from indulging in unethical practices which may harm the organizations. V.P. Sharma, Vice President North said that PR profession is better amongst all other professions in the world which gives instant results followed by Tourism sector which not only provides enough scope for re-creation but also creates employment and self-employment opportunities. He said that as of today 11 percent of total population of world was working in tourism sector and the percentage being 6.5 in Indian context. Earlier B.D. 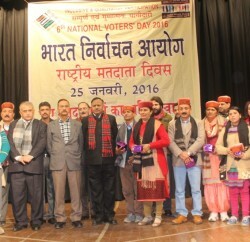 Sharma, President PRSI, Shimla Chapter welcomed the Chief Guest and other dignitaries present on the occasion. He said that the idea of hosting this conference in Shimla was taken in National conference of PRSI in Delhi by Ajit Pathak. He thanked for the support and Guidance of Ajay Mittal, without whom, this could not have been possible, said he. Sharma also detailed various activities being undertaken by PRSI chapter Shimla. B.D. Sharma was honoured with the best Chairman Award of PRSI along with N.L Narasimha of Ahemdabad PRSI Chapter. The award was given by Ajay Mittal, ACS. Besides, various other awards were given in different categories in PR profession. Arye also released the souvenir on the occasion. Vijay Verma, Vice President proposed vote of Thanks. Arti Gupta conducted the proceedings of the conference. Ms Nivedita Bannerjee, Secretary PRSI, Delegates from various organization both Public and Private sector, Industrial concerns, voluntary organizations from all over the country as well as from abroad were present on the occasion.